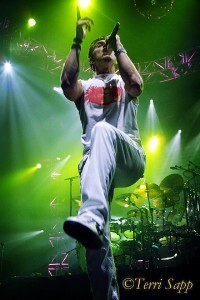 As most of you know, any time 311 gives Concert Sutra the opportunity to include them in our coverage, we ALWAYS take it happily! On July 26, 2008, 311 came to Atlanta with the ever popular and exciting performer Snoop Dogg, which is a real power house lineup for any one night at Lakewood Amphitheatre. The result of such a combination is a night that will not soon be forgotten! Once Snoop Dogg was done with the masses of fans huddled around to witness this high entertainment, 311 was able to slide right in drive home the good vibes to all who were there to receive them. Just in time for me to really start enjoying the show and breathe deep, knowing whatever photos I was going to get up close have been gotten, “All Mixed Up” rears its groovy head. I love their live version of this one, because of the extended reggae love fest in the middle, “cause you turn me on…you turn me on…you turn me on and on and on and on and on! !” As Nick Hexum said, “The unity is definitely in the house tonight!” It is fitting that this statement would lead right into heavy hit “Unity,” which has been the title track to the last several 311 Tours. 311 has a way of seamlessly guiding the audience from extremely high energy to a mellow melodic state of swaying, as evidenced with the transition from “Unity” to “Beyond The Gray Sky” from Evolver. I absolutely adore the music and lyrics of “Gray Sky,” and it has become one of my more recent favorites live. (To quote Todd from back in the day) LOVE IT! 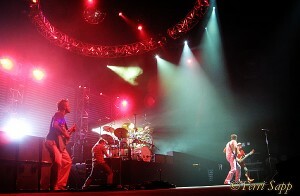 “Unity” is the title track from the last several tours from 311, so fitting that they have begun playing it more often again these days. Hearing songs like my favorite from the album Evolver, “Beyond The Gray Sky” makes me so thankful for being back in the swing of things, and being able to walk without a cane after my back surgery in such a short amount of time! The camera bag is sort of a drag, literally, but the music makes the lug worth every pound! After many rounds of Atlanta’s own chant, “3-11, 3-3-11!,” the band came back out and started their encore with “Feels So Good.” 311 never leaves without asking P-Nut to beat that thing. “Creatures (For A While)” has made its way into my heart after hearing it a few times. What a fun song for the end of such a fun show! The best part of the show was Nick Hexum’s stage dive during the last song, “Fat Chance.” I have not seen one of these in many years! After beginning the healing process for a few months now, I can easily say that I am extremely happy to be back to the world of the living, rocking, and especially the world of 311! I know I have an extreme challenge ahead of me in the next year or two, but knowing there are good times to be had at the same time, and the ability to dance again with tremendously less pain makes me smile from ear to ear! 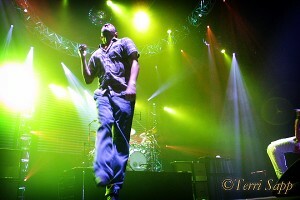 Even my musician man, Noel, enjoyed the show, and thinks that 311 is a very talented and tightly talented band! 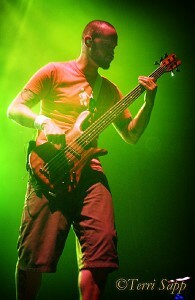 I LOVE exposing 311 virgins to their live shows, because they are always a lot of fun. To view the 2008 photo gallery, go to: http://www.leahyetter.com/080731311/. 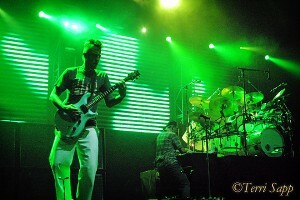 For more information on all things 311, visit them at http://www.311.com/. One Love!